It has been a couple of weeks since I was able to get the kayak out to chase some trophies. I had been checking the weather for a few days and it looked like it was going to line up perfectly with my day off of work and school. I made sure to get my bait the night before so I could get an early start the next day. I was on the water by 7am and made the long paddle to my first spot. Without a depth finder sometimes it can be hard to locate Crappie that are suspended. This is why I chose to fish visible vertical structure because if you can see the cover that the fish are hiding on, the only thing left to figure out is the depth they want. As I approached my first location I prepared a rod with a small jig rigged below a medium minnow. I dropped the bait down to the bottom and slowly jigged it. After about 15 minutes of nothing near the bottom I reeled the rig up to about the center of the water column and that’s when it got crazy. One drop after another I began to hoist in Crappie after Crappie from 10-14”. Even though these were quality fish, I was looking for a 15” or a 2 pounder. 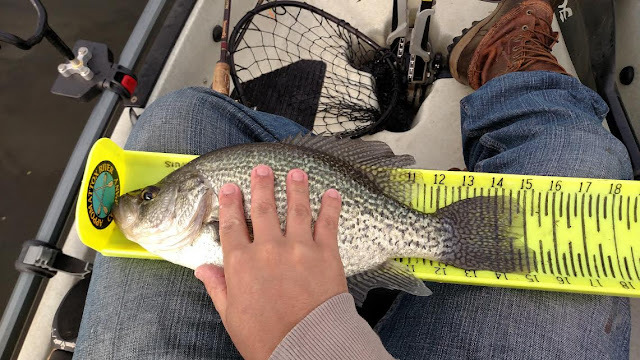 Now to most people, 15” doesn’t sound much larger than 14”, but I found out soon enough that extra 1” is a whole lot of Crappie! 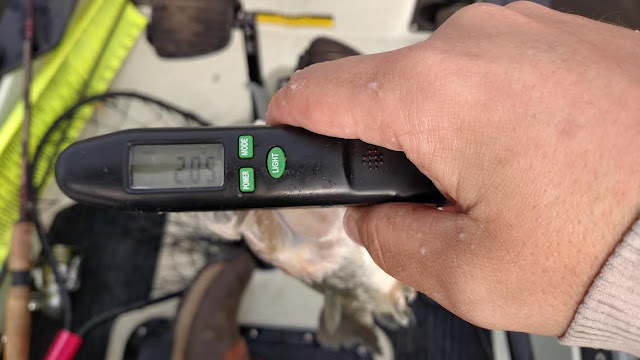 After about 30 fish all in the 12-14” range I decided to weigh one of the larger fish just to see how close to two pounds I was. The 14” Crappie I put on the scale weighed 1.57lbs. I was fairly surprised because this was a healthy and fat fish for its size. I decided to let the fish at my first location rest as I moved to another spot in hopes that I would find some larger fish. The second spot I went to typically isn’t fished as hard due to how far away it is from the ramp. I figured the less pressure might aid in some larger fish calling it home. On my first few drops I came up empty. No bites, no bumps, no nibbles no anything. 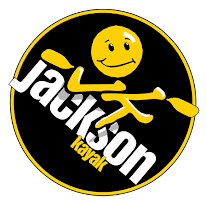 I was a little discouraged because of the long paddle I made to get there. As soon as I began to consider going back to my previous spot I felt a very subtle tick. I set the hook hard and lifted a 14” Crappie into the Pro Angler. My first fish at this spot was as big as the largest I had landed at the previous. Even though it was slow, I decided to fish on. On my very next drop, luck was on my side. Again, I felt a VERY soft tick and set hard. I immediately knew this was a larger fish because of the weight. When I saw it come up I was shaking because it looked massive in comparison to the 14”ers I had been catching. After a few hard headshakes and some short dives I had her in the net. She came in at 15.25” and 2.05lbs. I was amazed that that extra 1.25” added an entire ½ pound to the fish. After some quick photos I released her back to where she came. After fishing for a couple more hours to burn through the last bit of bait I had left I realized that this was only my first real attempt at targeting a citation Crappie. It was nice for a plan to come together on the first trip without too many hiccups along the way for a change. This Crappie was my 13th different Virginia citation species to date. The chase for these citations has become beyond addicting and I can’t wait to get after another one. Now it’s time to start getting a plan together for the next species on the list! With Thanksgiving and our annual family hunting trip coming up next week, I took advantage of this last weekend to try and bag a few more citations before the break. I geared up to try and take down a few more White Perch or possibly another big Channel Cat but I quickly realized it would not be that simple. After scoping out some of the deeper creek channels it became pretty apparent that the lake was in the beginning stages of its “turning over” period. Lake “turn over” happens when the hot days of Summer transition into the cooler, shorter days of Fall. This prompts the warmer surface layer of the water column, once heated by the Summer sun, to cool and sink, which in-turn pushes the bottom layer up towards the surface, lifting leaves and light debris to the surface with it. Once late Fall and Winter sets in, after the turn over, the deepest layer of the water column is also the warmest and most stable, far less effected by daily changes in temperature and weather pattern. This is why the vast majority of your fish will always be found deep this time of year. It took a while but I eventually found a pocket of fish. I proceeded to land White Catfish as fast as I could reel them in and I even picked off a decent Channel Cat and a few straggler Perch. 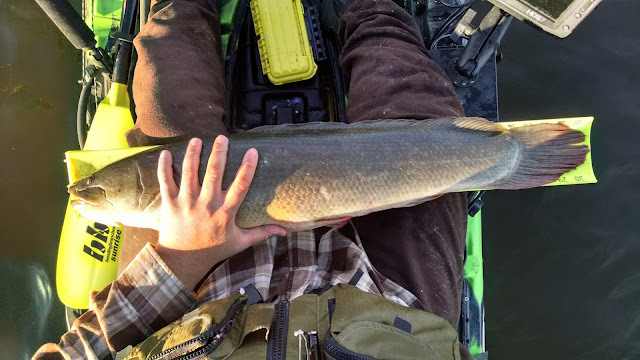 The day was capped off by an absolute monster of a Bowfin that came as a welcomed surprise after the endless supply of White Cats. Upon coming aboard, she quickly displayed her displeasure with the situation by obliterating my measuring board. Not before I got a measurement though! 31 inches long, 10 pounds 12 ounces, A Virginia trophy fish and my second trophy Bowfin of 2015! It was a fun little trip before a week of family, food, and tradition. Time to relax a bit and recharge the batteries before we charge into the cold, bitterness of Winter fishing.